One: Organic Mechanic. 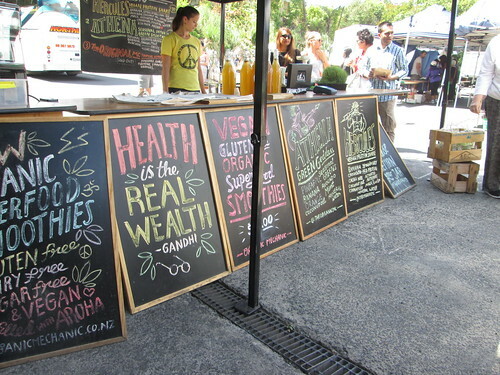 The Mechanic makes organic, vegan, superfood smoothies, and other healthy drinks like kombucha and nut mylks. They’re interested in ideas about food as medicine, and they also write about wellbeing through mindfulness and connecting with nature, exercise, generosity and gratitude, drinking more water, and being friendly. 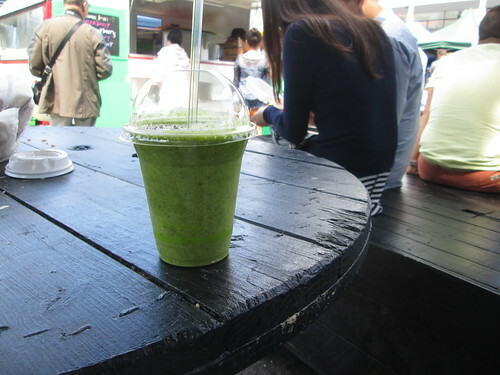 It’s all very lovely, and fortunately their smoothies are delicious, too. I had an Athena green goddess smoothie, made of pineapple, banana, orange, coconut oil, greens, avocado, mint and filtered water. It was a perfect balance of flavours and textures – no hint of green bitterness, not particularly sweet, with some of the smoothness, but none of the thickness, of avocado. Two: Musical Knives Salads. This was an exciting discovery: Peter Chaplin’s Musical Knives (the legendary ’90s Ponsonby vegetarian restaurant) has been reborn as Musical Knives Food (pre-packaged salads and soups, and event catering – almost all vegetarian & mostly vegan). Musical Knives salads are available every weekend at La Cigale for the retro-’90s price of only $5. 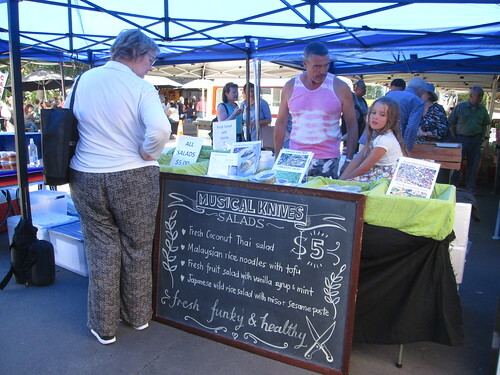 They’re also stocked at Harvest Wholefoods, Huckleberry Farms, and a few supermarkets listed on the website. 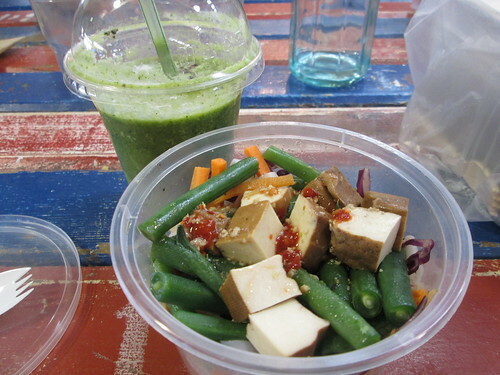 I had a Malaysian rice noodle salad with firm tofu, crisp vegetables and beautifully spicy thick rice noodles. Most of the salads on offer were vegan – not labelled as such, but Peter was happy to point out which ones were suitable. Three: The Raw Kitchen. 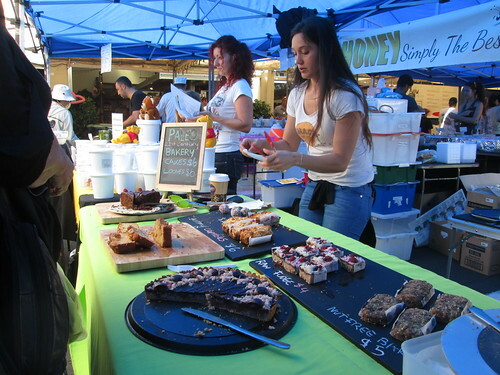 I’d tried slices of the Kitchen’s raw cakes before from RAD in Mount Eden, and I’d been drooling over their Instagram feed for a while, but hadn’t visited their market stall. It’s not unlike their Instagram photos: various beautiful raw, vegan, gluten-free cakes and sweet treats, well presented. 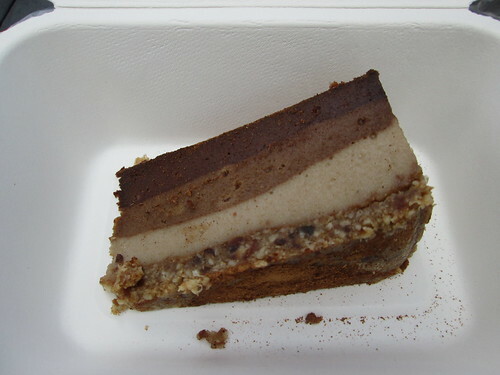 I had a slice of tiramisu cake for lunch dessert, which was delicate and lovely. 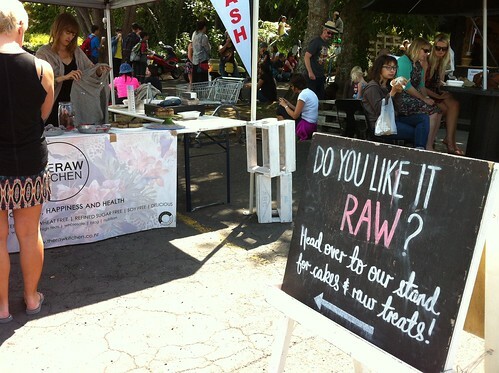 As well as the La Cigale stall, The Raw Kitchen has just recently opened their own shop in Ponsonby. I haven’t been yet; it’s at 267 Ponsonby Road. Four: Snack On Me Naturally. This paleo-inspired bakery doesn’t use egg yolk, butter or milk in its recipes, so a few of its treats are vegan. The selection yesterday included nut-free muesli bars and a range of fruit crumbles. I didn’t have enough room to try anything from this stall; next time! 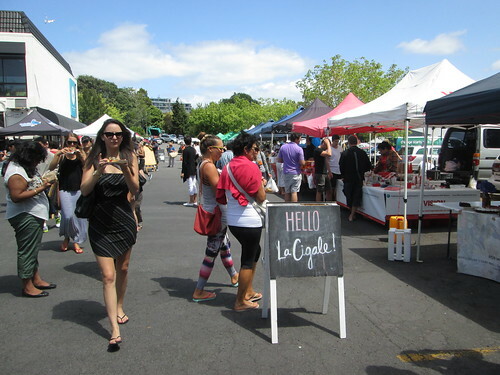 La Cigale French Market happens every weekend: Saturday 8am to 1.30 pm, and Sunday 9am to 1.30pm. It’s held at 69 St Georges Bay Rd, Parnell.